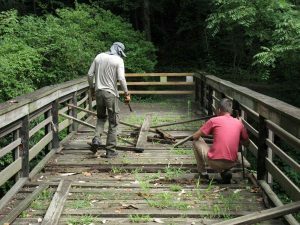 Last year, we began one of our largest fundraising efforts in decades at the Botanical Gardens at Asheville: raising enough money to replace the Gardens’ condemned Demmon Bridge. An engineering inspection revealed a structure too far gone for repair and in need of immediate closure. The bridge is located next to a magnificent Sycamore and a bank rich in delicate spring wildflower plantings. Protecting the fragile botany around the bridge will take priority during the project. As you can imagine, the price tag for removing the old bridge and replacing it gave us a good case of sticker shock. Engineers have told us that we’re looking at a $140,000 bill by the end of the project. That’s why we’re making a special appeal to everyone who loves and enjoys the Gardens to donate to the cause. On the bright side, thanks to the generosity of many donors, we’re more than half way there! We would like to complete the bridge replacement during this coming winter, before the spring growing season. Can you help us reach our fundraising goal? To make a donation, call us during Visitor Center hours at 828-252-5190 or mail a check to BGA, Attn. Bridge Fund, 151 W.T. Weaver Blvd., Asheville, NC, 28804. Thanks!